The Stanley Cup is the most revered trophy in sports. But it's had a hard life. The Cup has been banged around, misplaced and used for a variety of other purposes across the years. Here are some of the Cup's misadventures since it was first awarded in 1893. 1905: A member of the Ottawa Senators tried to drop-kick the Cup across the Rideau Canal. Luckily, the canal was frozen and they were able to retrieve the trophy. 1906: The Montreal Wanderers left the Cup at a photographer's studio for several weeks before anyone realized it was missing. Officials retrieved it after finding out that the photographer was using the Cup to plant geraniums. 1924: Players on the Montreal Canadiens were en route to celebrate their victory at the house of owner Leo Dandurand when they got a flat tire. They took the Cup out of the trunk to change the flat, then left it on the side of the road. Amazingly, they came back and found the Cup right where they had left it. 1925: Youngsters Lynn and Muzz Patrick, sons of Victoria Cougars' general manager-coach Lester Patrick, found the Cup in the basement of their home and scratched their names on it with a nail. Fifteen years later, they got their names on the Cup for real after the New York Rangers won the Cup in 1940. 1940-41: The Rangers not only won the Cup in the spring of 1940, they paid off the mortgage on Madison Square Garden not long afterward. To celebrate, the Rangers lit the mortgage on fire while it was in the Cup, causing the Cup to catch on fire. Supposedly, the "hockey gods" were upset and put a curse on the Rangers; regardless of the reason, the team had to wait until 1994 to win another Cup. 1957: Montreal's Maurice "Rocket" Richard chipped two of his front teeth while drinking from the Cup. 1961: After Montreal won five Cups in a row from 1956-60, many Canadiens fans regarded the Cup as theirs. One fan took that to extremes -- in Game 6 of the semifinals at Chicago Stadium, the Canadiens were about to be eliminated when a fan named Ken Kilander was so upset he left his seat, raced to the lobby and broke the glass showcase around the Cup. Kilander headed for the exit but was caught and arrested. He explained his behavior to the judge by saying, "Your Honor, I was simply bringing the Cup back to Montreal where it belongs." 1962: During the Toronto Maple Leafs' party after winning the Cup, the trophy was badly damaged in a bonfire. The team had to foot the repair bill. 1979: After the Montreal Canadiens won their fourth consecutive championship, Guy Lafleur "borrowed" the Cup without telling anyone to show his friends back home in Thurso, Quebec -- this was before the days of each player getting his day with the Cup. Lafleur put the Cup on his front lawn for his neighbors to see and take photos. Lafleur returned the Cup later that night but was told never to repeat his stunt. 1980: The New York Islanders won four straight Stanley Cups in the 1980s, and to say they enjoyed having it would be putting it mildly. Forward Clark Gillies celebrated by filling the Cup with dog food and allowing his pooch to eat out of it. Bryan Trottier later admitted to sleeping with the Cup (many other players reportedly also have done so). 1987: After the Edmonton Oilers won their third title in four years, Mark Messier brought the Cup to his favorite club in his hometown (St. Albert, Alberta) and allowed fans to drink from it. It wound up being bent in a few places and was repaired at a local body shop before being returned to the Hockey Hall of Fame. 1991/1993: Both Pittsburgh ('91) and Montreal ('93) tested the Cup's buoyancy by tossing it in a swimming pool -- the Penguins used Mario Lemieux's pool; the Canadiens tossed it into Patrick Roy's. In each case, the Cup wound up on the bottom of the pool. 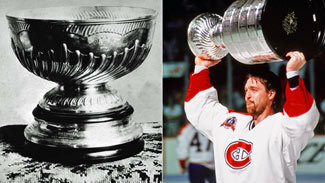 Noted Montreal captain Guy Carbonneau after the Canadiens sent the trophy for a swim: "The Cup does not float." 1994: The New York Rangers, after winning their first Cup in 54 years, decided to share their championship with another champ: They took the Cup to Belmont Park, filled it with oats and let Kentucky Derby winner Go For Gin chow down. 1996: After winning the 1996 Stanley Cup with the Colorado Avalanche, defenseman Sylvain Lefebvre used his day with the Cup to have his daughter baptized in it. 2004: Walter Neubrand, the keeper of the Cup, boarded a plane to Fort St. John, British Columbia, to deliver the trophy to Jake Goertzen, the Tampa Bay Lightning's head scout. However, officials of Air Canada at Vancouver's airport removed the Cup before takeoff due to weight restrictions. The Cup spent the night in the luggage area before being flown to Fort St. John the following day. 2008: After the Red Wings' Stanley Cup parade, the Cup was pushed off a table at Chris Chelios' Chili Bar in Detroit. It received a dent, which was later smoothed out. However, following the NHL Awards, it was revealed that the damage was more extensive than originally realized. 2011: On Michael Ryder's day with the Cup, it fell off a table at a media event in St. John's, Newfoundland -- just prior to the trophy's departure to the Boston Bruins forward's hometown, Bonavista, Newfoundland.